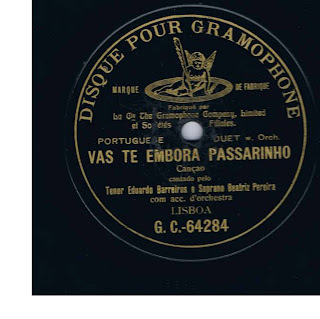 THIS BLOG PRETENDS TO SHOW ONE OF THE BIGGEST COLLECTIONS OF PORTUGUESE 78 RPM FADO RECORDS. FADO HAS BECOME WORLD HERITAGE AND WE KNOW THAT AROUND THE WORLD PEOPLE WANT TO KNOW MORE ABOUT FADO. WE HOPE THIS BLOG CAN HELP ON IT. This is a very popular song in the south of Portugal. In this region of Portugal the poliphonic coral singing, usually only with mans, is very popular. Hundred of groups still exist, specially in the districts of Évora and Beja. They have a very powerfull presence in stage. The style of those coral groups is known as Cante and very recently this tradition is preparing to be niminated as Cultural Heritage at Unesco. Here, in this record the song "Vas te embora Passarinho", which means "Go way little bird" sounds very different because we can listen only two voices, one male singer (Edurado Barreiros) and one woman (Beatriz Pereira).